Sophisticates Hairstyle Guide showcases the most current styles, and features over 900 hairstyles per issue, much more than any other magazine. It is written for women of all ages and diversity who are interested in the latest hair and beauty trends. It is edited for the stylish woman who wants to know more about her favorite celebrities and enjoys in-depth interviews with not only these style icons, but their beauty teams as well. Each exclusive, lavishly reproduced edition of Sophisticate’s Hairstyle Guide features hair designs from around the world—showcasing sumptuous style diversity with complete information on how readers can re-create the looks either at home or at their favorite salon. Wrapped in luxurious imagery, each issue of Sophisticate’s is an exquisite not-to be-missed gift to our reader. 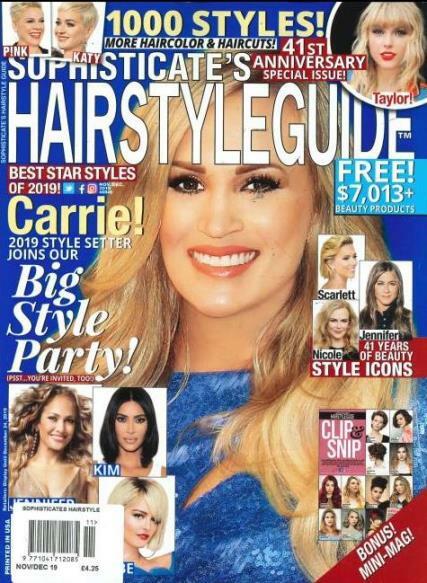 From revealing interviews to hair-care stories devoted to the latest new product news to an in-depth salon directory to a special Sophisticate’s Clip & Snip featuring over 500 new looks—Sophisticate’s Hairstyle Guide is the style guide for today’s trendsetting woman…no matter what her age. Over 1.5 million women can’t be wrong!